A dozen roses with 3 special occasion Helium Balloon. Please Note: Balloon Design May Vary. Your purchase includes a complimentary personalized gift message. Flowers are Almighty''s most beautiful creation. This collection of 25 Peach Roses will delight anyone. The assortment comes with 6 full blown muti-color balloon. A sweet yet warm way of expressing the feelings of heart. Send this outstanding floral arrangement to that special person in Philippines. 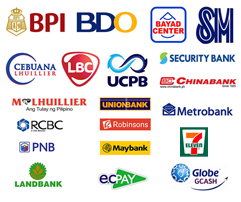 Send Gifts and Flowers to Philippines with us and add to your dear ones. Please Note: The colors and size of the balloons may vary depending upon their availability Your purchase includes a complimentary personalized gift message. 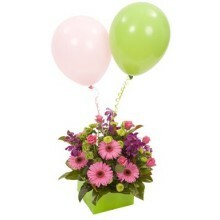 azzle someone on their special day with a delightful flower bouquet and a shiny birthday balloon! 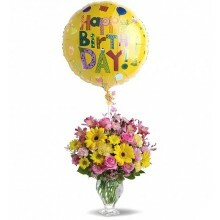 A cheerful Mylar balloon tops a pretty bouquet of freshly cut flowers in pink and yellow hues. The recipient's favorite flower is sure to be found in this festive arrangement of roses, gerberas, daisy spray chrysanthemums, alstroemeria, carnations, Matsumoto asters, and more. Measures. To ensure the best arrangement, flower varieties and balloon design may vary. Birthday Wishes Bouquet has been purchased most frequently by our customer for the following occasions: Birthday Anniversary Please Note: The colors and size of the balloons may vary depending upon their availability Your purchase includes a complimentary personalized gift message. A Gift Basket is always an enticing present. Send 2kg fresh seasonal fruits (Apple, Grapes, Pomigranate, Sweet Lime) in a basket. The basket is adorned with four stemmed purple orchids and greenery further adds to the elegance. 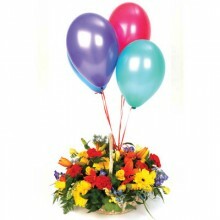 The multi-colored blown balloons(6 Piece) along with the basket complement it the best. This will be fantastic gifting idea on any occasion. Please Note: The colors and size of the balloons may vary depending upon their availability Your purchase includes a complimentary personalized gift message. "A Touch of Fun" - A vibrant arrangement presented in a basket, typically including gerberas, freesias, carnations, roses, liliums and foliage with five coloured latex balloons. Please Note: The colors and size of the balloons may vary depending upon their availability Your purchase includes a complimentary personalized gift message. "Congratulations!" - A pretty basket arrangement typically including, gerberas, roses, carnations and orchids presented with three latex balloons. Choose your colour scheme to suit the occasion Please Note: The colors and size of the balloons may vary depending upon their availability Your purchase includes a complimentary personalized gift message. 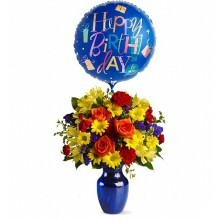 Make birthday spirits soar by sending this fabulously fun birthday bouquet topped with a Mylar balloon. Cheerful blossoms in bold primary colors fill a stylish glass vase, and include such favorites as roses, carnations, daisy spray chrysanthemums, statice, and alstroemeria. A great gift choice for both guys and gals, this popular combination bouquet sends the happiest of birthday wishes. 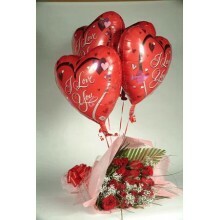 To ensure the best arrangement, flower varieties and pictured balloon design may vary. 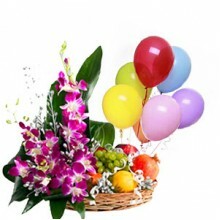 Fly Away Birthday Bouquet has been purchased most frequently by our customer for the following occasions: Birthday Anniversary Get Well New Baby Admin's Day Please Note: The colors and size of the balloons may vary depending upon their availability. Vase is not included. Your purchase includes a complimentary personalized gift message. Pink gerberas, purple Vanda orchids, mini roses and green chrysanthemum in a funky box with 2 helium balloons to mark the occasion. Please Note: The colors and size of the balloons may vary depending upon their availability Your purchase includes a complimentary personalized gift message. 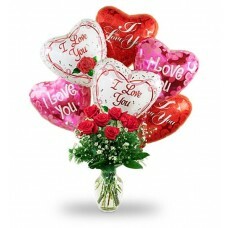 Romance them with our six stunning long-stemmed roses topped with a half dozen romantic "I love you" mylar balloons and they'll be walking on air! Fresh, red roses in a glass vase with delicate florals and greens. Balloon designs may vary. Measures approximately 20" H x 10" D. The Perfect Dozen has been purchased most frequently by our customer for the following occasions: Anniversary Romantic Valentine's Day Thinking of You Birthday Please Note: The colors and size of the balloons may vary depending upon their availability Your purchase includes a complimentary personalized gift message.